Akiko and Navid’s gestural-sonic mantras transcend aesthetic form to make the imperceptible palpable. That is to say, we embark with them on a metaphysical journey—of a body in conversation with the living cosmos. The interactive scenography* and gestural sound instruments, invisible to the senses, enchant the subtlest of movements, bringing the body into prominence. We are fully immersed in unstable sonic architectures, which dissolve the dancer’s micro-movements into an ocean of ephemeral micro-intelligences. In turn, textural tonalities of the body’s movement cause this sonic ecology to morph in an endless performative feedback: sensually binding, spatially confusing and temporally unsettling. A compelling trans-sensorial universe that will pull you surely, inevitably into its vertiginous trance-like ritual. *interactive scenography: Dancer’s movements are picked up through an array of embedded sensors and realtime tracking cameras. The input from these sensors are processed through computer vision techniques and used in real-time to produce interactive sound and visual patterns, driven directly or at times indirectly by the dancer’s movements. The solo “TranSenses,” was technically impressive, with elaborate interactive audiovisual effects. At every point, Ms. Kitamura was brilliantly controlled. Born in 1970 in Tokyo, Akiko Kitamura is graduated from Waseda University Master Course. Between 1994 and 2009, she directed a dance company named Leni-Basso. In 1995-1996, Akiko had the opportunity to stay in Berlin with the support of the Agency for Cultural Affairs of Japan. In 2001, she was invited to Bates Dance Festival in Lewiston, Maine (USA) adn then in 2003, she was commissionned by ADF (American Dance Festival) to create a short piece titled Enact Oneself with ADF dancers for the International Choreographers Commission Program. The piece was chosen as one of the best dance of the year in North Carolina. In 2005, she created ghostly round for In Transit 2005, a festival organized by Haus der Kulturen der Welt in Berlin. 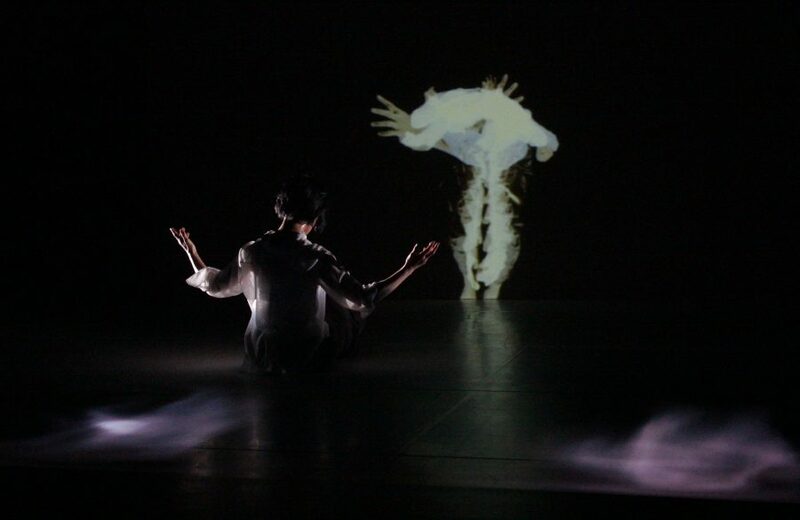 Between 2011 and 2014, Akiko started a collaborative project, To Belong series along with Indonesian artists, which was performed in Japan, Singapore and Indonesia. She also choreographed for Tari Opera Gandari in Jakarta and received the ACC Fellowship Grants to Individuals in 2015 (Japan-United States Arts Program/Saison Foundation Fellow). Afterwards, she began a collaborative project with Cambodian Artists, named ”Cross Transit”. Since 2001, Akiko Kitamura has taught at Shinshu University, Nagano, as associate professor of the Faculty of Arts. Navid Navab is a media alchemist, composer, phono-menologist, gestureBender, audiovisual sculptor, perSonifier, and multidisciplinary artist. Interested in the poetics of gesture, materiality, and embodiment, his work investigates the transmutation of matter and the enrichment of its inherent performative qualities. Navid uses gestures, rhythms and vibration from everyday life as basis for real-time compositions, resulting in augmented acoustical poetry and painterly light that enchants improvisational and pedestrian movements. Navid currently co-directs the Topological Media Lab, where he leverages phenomenological studies to inform the creation of computationally-augmented performance environments. 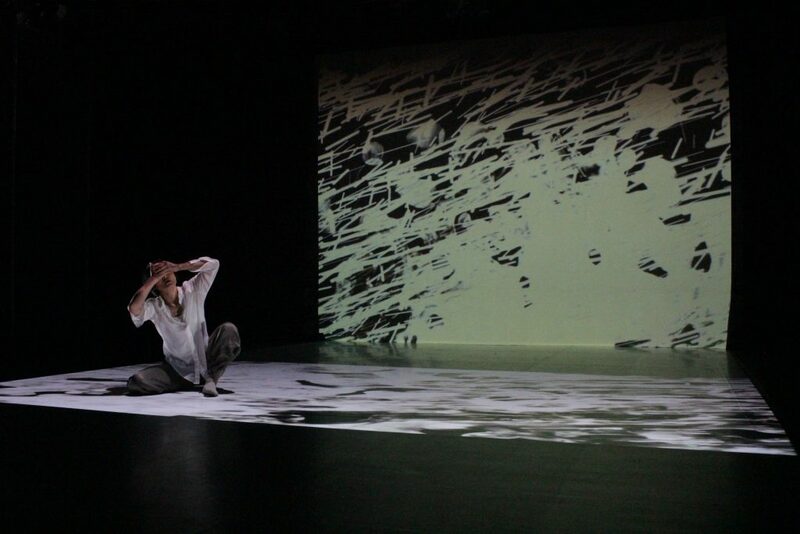 His works, which take on the form of gestural sound compositions, responsive architecture, site specific interventions, theatrical interactive installations, kinetic sound-sculptures, and multimodal improv-based performances, are presented internationally at venues such as: Ars Electronica, Canadian Center for Architecture, Contemporary Arts Museum Houston, Festival du Nouveau Cinema, Shanghai eArts, HKW Berlin, and CURRENTS Santa Fe. In this intermedia and interactive encounter, the theatre is turned inside out. The dancers and musicians perform behind us; it is only by way of mirrors that we piece together moments, as if editing a live film from our own perspective. Gradually, we are offered sensory fragments: the reflection of a torso sweeping past; gentle pulsations in the floor; wandering rhythms in the live instrumentation – provoked by the heartbeat of the dancers. It is difficult to capture anything or anyone, fully. There is darkness and stillness; there is breath; there is intense physical exertion and exhaustion. Nothing concludes. Everything assembles and shatters. It shatters like glass, and as we piece the shards back together, unfamiliar forms emerge. As collaborators, we design conditions for promiscuous encounters between multiple performers, human and nonhuman. Our work is grounded by the premise that expression is always mediated by sensory and technological perception, in ways that cannot be disentangled. We are interested in shaping processes of mediation, rather than crafting outcomes. We resist seductive accounts of technology as a means to reveal or represent invisible aspects of embodiment. In place, we engage biosensors to instigate poly-amorous and poly-temporal relations between physiology, movement, music, media, and environment. We are using electrocardiograms (ECGs) specifically because the fractal rhythms of heart rate variability produce aesthetic complexity, and suggest multidirectional flows between self, other, and surroundings. Teoma Naccarato (Montréal, Canada / London, UK) is a choreographer and interdisciplinary arts researcher. Through her collaborative creations for stage and installation, she explores the appropriation of surveillance and biomedical technologies in contemporary dance and performance. Her work proposes promiscuous encounters between participants, human and nonhuman, to provoke intimacy, vulnerability, and uncertainty. She has shared choreography internationally, with recent presentations of Experience #1167, Synchronism, and X. Naccarato has an MFA in Dance from the Ohio State University, and presently pursuing a practice-based PhD at the Centre for Dance Research (C-DaRE) at Coventry University. John MacCallum (Oakland, USA / Paris, France) is a composer based, since 2004, in Oakland, California. His work is heavily reliant on technology both as a compositional tool and as an integral aspect of performance. His works often employ carefully constrained algorithms that are allowed to evolve differently and yet predictably each time they are performed. MacCallum studied at the University of the Pacific (B.M. ), McGill University (M.M. ), and UC Berkeley (Ph.D., Music Composition) where he is currently a postdoctoral researcher at the Center for New Music and Audio Technologies (CNMAT). In the Fall of 2016, he will begin work as a postdoctoral researcher with the Extreme Interaction (EX-SITU) research team at Inria Saclay/Université Paris-Sud/CNRS. Laura Boudou (Marseille, France) is a contemporary dancer and choreographer. Since 2013, she has performed professionally with choreographers in France, including Shlomi Tuizer/Edmond Russo, Samir El Yamni, Lionel Hoche, Patrice Barthès, Nicolas Hubert, and Patrick Servius. 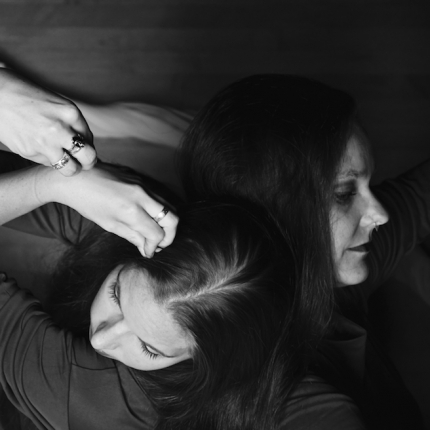 Boudou’s choreographic work examines the sharing and negotiation of differences within human relationships, to build deeper understanding and intimacy. Recent creations include LOVOL in public space in collaboration with Sophia Boudou Architecte-scenographe, B333 (2016), and Voile de croissance (2012). Kim L. Rouchdy (Montreal, Canada) completed her BFA in Contemporary Dance at Concordia University in 2015. As a multidisciplinary artist, she studied Set and Costume design for Theatre at the National Theatre School and St-Hyacinthe Cegep. In her current work, these different artistic practices combine to influence and inform her approach. 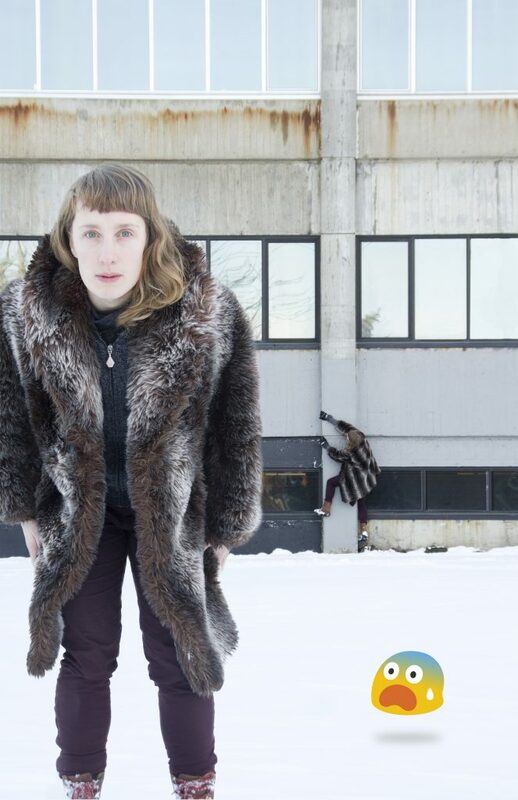 As a choreographer, performer, and collaborator, Kim is active in the emerging arts scene in Montreal, and she has participated in residencies such as Top Chrono (2016), Mi-Lune de Fleur d’asphalte (2016), Nous sommes ici, and LA SERRE – arts vivants (2015). In 2015 she presented her piece Lumen Extra Terram at the Phénoména Festival. Kim has performed for choreographers such as Hélène Rémoué, Ariane Dessaulles, Chloé Bourdages-Roy and Catherine Laframboise Desjardins. Manuel Shink (Montréal, Canada) is a recent graduate from Concordia University in choreography, and also completed the dance program at EDCMTL. Manuel has worked with several choreographers such as Harold Rhéaume, Daniel Bélanger, Lucie Grégoire, Andrew Turner, and Eroca Nicols, in Montreal, Quebec, Toronto, St. John, and Berlin. With a cinema and photography background, as well as a certificate in psychology, he works his dance material by giving specific attention to rhythm, space, narrative and ambiance. His signature involves sensitivity, naiveté, sensuality and an unpredictable comical touch. He makes use of drag-queen, performance, Butoh, and clown work. Anne Bucchi (Montreal, Canada) As a percussionist Anne is actively involved in contemporary music and new forms of improvisation, particularly in chamber music and in projects related to dance. She holds Masters in Performance and Music Teaching, a Postgrad in Chamber Music from the HEM in Geneva, and an Artist Diploma from McGill University in Montreal. She also plays flute and tablas. Anne is currently developing a research project on music learning during early childhood, which combines her expertise in music, with her parallel studies in developmental psychology. Ryan Kelly (Montreal, Canada) is a percussionist gone astray, working on harsh noise and experimental music. He mixes sounds at the limits of his classical training with techniques of electronic music to create noise with programmed and performed (im)precision. He believes that there is something special in sounds that avoid being fixed in notation, that test performer reproducibility and that resist the discretization of the digital, and aims to develop the relations between them into a music that exceeds its own logic. His goal is not to blow out your speakers, but this might be an intermediate step. Elizabeth Lima (Montreal, Canada) The centerpiece of Elizabeth Lima’s improvisational practice (voice and clarinet) is the emotional response to sound: the human experience and interconnection shared amongst musicians and with the audience. She creates performances in which traditional and extended techniques are combined with theatrical elements. Bailey Eng (Montreal, Canada) Bailey’s current movement practices stem from contemporary dance, breaking, parkour, contortion, and Chinese pole. She graduated from Concordia University with a BFA in Contemporary Dance, and also studied at L’Ecole Nationale de Cirque and York University. She has done several performances which incorporate dance, circus, and parkour, including work with Andreane Leclerc, La Marche du Crabe, Jeff Hall, and Les Minutes Completement Cirque. In addition to performing, she is also an emerging choreographer and coach of acrobatics and dance. Lucy Fandel (Montreal, Canada) is a dance artist and writer. She completed a double major at Concordia University in dance and sociology, which sparked her ongoing explorations of social, scientific and artistic methods of learning, femininity and the social body in crisis. She has performed and presented in Montreal’s Nuit Blanche, Art Matters and the Festival International du Film Ethnographique de Québec. 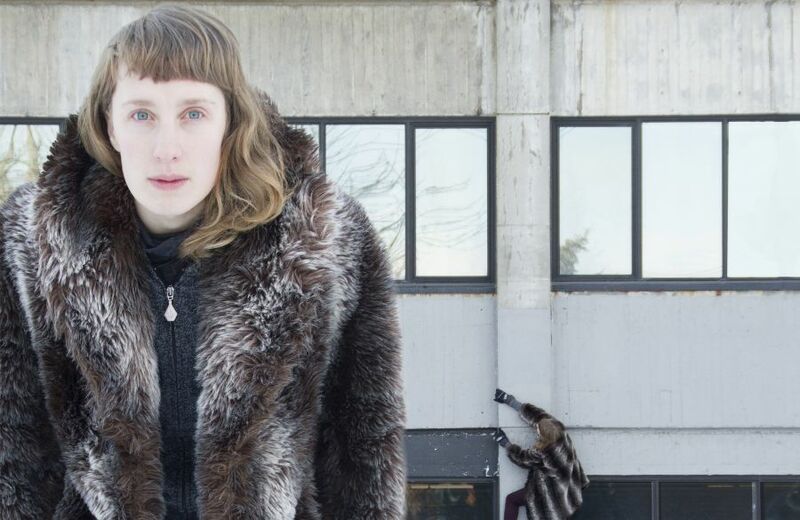 She is currently a contributor to The Dance Current magazine, project coordinator for Mouvement Perpétuel (co-directors Marlene Millar and Philip Szporer), and co-organizer of the dance creation lab Nous Sommes l’Été. Abe Mijnheer (Montreal, Canada) was born in 1992 in Aalst, Belgium and raised in Holland. Abe has a background in soccer, which he gave up to pursue his other great passion: dance. Abe moved from the Netherlands to Montréal in 2012 to begin his BFA in Contemporary Dance at Concordia University, and is presently a student at l’Ecole de Dance Contemporaine de Montréal. Abe has danced for choreographers such as Sacha Kleinplatz and Sébastien Provencher. The intimate café-bar and corridors surrounding our theatre become sites for performance! Binary Animal is a series of short installation pieces exploring our virtual identities. 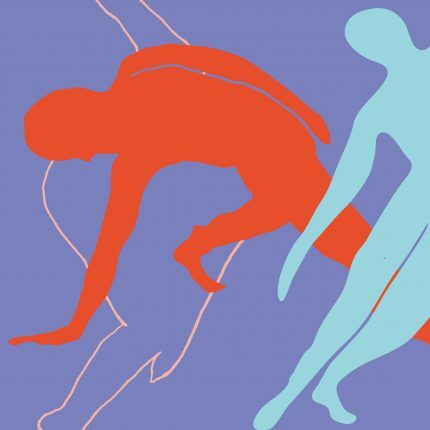 We have freedom of movement within this performance parcours, choosing what we want to see of the two captive dancers, connected via live stream video. We can only glean a few fragments at a time by turning towards either bodies or their projected alter egos. The superimposition of both realities discloses metaphorical questions about the duality of our identities: the one we reveal on the Internet, and the one we attribute to ourselves in “real” life. How much do we lose of ourselves, every day of our lives, in this virtual illusion? The piece has already been created and presented, although it continues to evolve. In particular, the integration of live stream video will be developed and adapted to the proportions of the Wilder building’s cafe-bar and corridors. Binary Animal explores an uncommon format that presents the piece as four performance installations of 10-15 minutes each. It allows the audience to move about during its presentation and gives them the freedom to choose how long to observe each section. This phase of the creative process will explore the evolution of a fragmented narrative in unconventional spaces and the improvement of the integration of livestream video. We will be working with the live stream system that I created on an almost daily basis during the first phase of this creation. Alejandro de Leon has developed a hybrid and interdisciplinary identity creating performances that open news ways to experience dance and to encounter the public. He has developed a rewarding career as a dancer working with prestigious companies and choreographers throughout Canada, Mexico and the USA (Royal Winnipeg Ballet, Hartford Ballet, Compañía Nacional de Danza in Mexico City, Compagnie Cas Public, Jose Návas/Compagnie Flak, Marie Chouinard) He has also collaborated with the renown Montreal choreographers: Louise Bédard, Lina Cruz, Roger Sinha and Sarah Bild. As a choreographer Alejandro puts a personal mark on spontaneous physicality that conveys human and absurd universes. 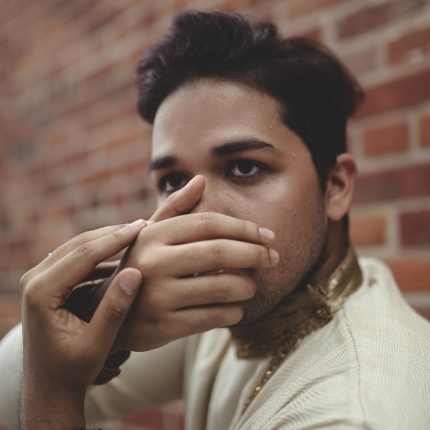 Parallel to his dance trajectory Alejandro has developed a successful trajectory as photographer and filmmaker, through the realization of multidisciplinary projects that evolve in several platforms. 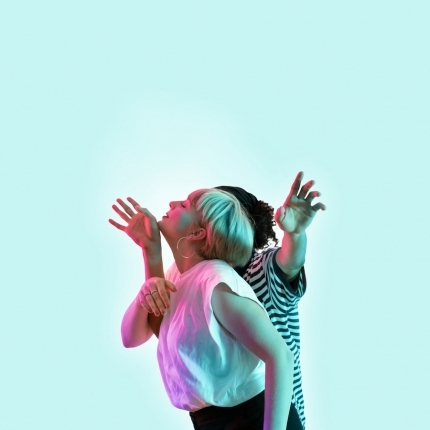 Amongst others, the dance web series Get Back to Me in which five Montreal based choreographers were invited to collaborate, the performance of The Few Things I Need in collaboration with the choreographer Louise Bédard and the cultural mediation program Chaises Musicales. He has collaborated with several choreographers and companies in Canada and Mexico in the realization of short films and larger scale installations. In Binary Animal Alejandro explores the contradictions of a culture dependent on virtual experiences. Working mainly with samplers, Diane Labrosse approaches music with unconventional sounds and noises. Since 1985, she has been performing regularly on the scenes of avant-garde and improvised music around the world. As a composer, she has created music for theatre (Robert Lepage, Gervais Gaudreault, Cathie Boyd), for dance (Louise Bédard, Andrew Harwood, Deborah Dunn, Crystal Pite) as well as multi-media installations : Canadian Music Center, Tura-ya-moya (Denmark) and Theatre Cryptic (Scotland). She has composed works for ensembles (Array Music, Now, Ensemble SuperMusique, Espaces Sonores Illimités, The Burdocks) and ships (Symphonies Portuaires). Her discography includes more than 50 recordings, most of which can be found on the Montréal independant label Ambiances Magnétiques. She was co-artistic director of Productions SuperMusique from 1979 to 2008. C’est ainsi qu’elle crée Le Mur des secrets en 2002 (installation thématique pour 16 haut-parleurs) ; Espèces en voie de disparition en 2007 (installation-performance basée sur le son d’objets désuets) ; Initiation au canot-camping en 2013 (installation spatialisée interactive). She has created several sound installations : Espèces en voie de disparition (2007) a multi-media installation for objects and performers sculptures ; Sports et divertissements (2013) interactive installation. Lucy M. May was born in Fredericton, New Brunswick. She completed her dance training at LADMMI in Montréal, and CODARTS | Rotterdam Dance Academy. 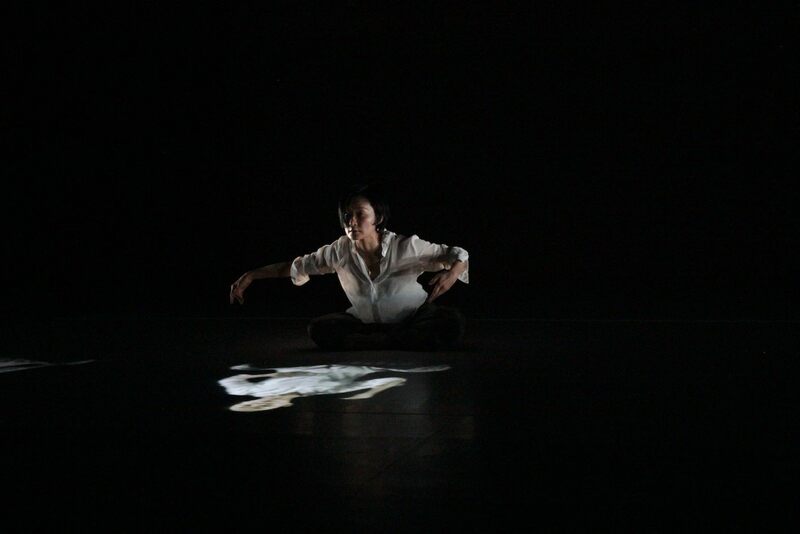 Between 2009 and 2016, Lucy was a member of Compagnie Marie Chouinard, creating roles for group works, the multimedia duet Corps Célestes, and the solo FOXP2. As an independent dancer, she worked with Sasha Kleinplatz, Jérôme Meyer and Isabelle Chaffaud, Lesandra Dodson, Melissa Raymond, Lucie Gregoire, Nadi Malengraux, and Georgia Rondos. In her own work—on stage or in unusual places, on paper, video, or the internet—she has returned again and again to porousness, spontaneity, interdependence, sincerity, and biology. Her collaborators include Paige Culley, Patrick Conan, Noémie Avidar, Erin Fortier, Lucy Karen May, Eduardo Menz, and Jacinte Armstrong. Recent projects include Esemplastic Landing (2016), Vivarium (2014), and Aika (2014). Lucy writes for The Dance Current, is an affiliate of Margie Gillis’ Legacy Project, and has taught across North America and Europe. She is a member of RQD, DTRC, and UDA. In the fall 2016 Lucy joins the creation of Binary Animal. Éclosion – What can I bring to this dance?